The Imagination Symphony is Chicago’s only non-profit devoted exclusively to introducing children to classical music. "The Adventures of Billy Billyewack"
An original production featuring professional actors and a full orchestra playing works by Wagner, Mendelssohn, and Rimsky-Korsakov"
The Imagination Symphony revolutionizes the way children experience classical music through children’s concerts that unite theatre, storytelling, lights, fun and action with a BIG, BIG symphony orchestra! This is an entertainment experience that will leave your children cheering for more and give your children a chance to love one of our most important art forms. Classical music is widely acknowledged by experts to positively impact childrens academic skills, emotional well being and creative energy. We are here to give your child the chance to experience the wonder and inspiration of a large symphony orchestra in a setting that is fun, relaxed and engaging. Even the parents will have fun. 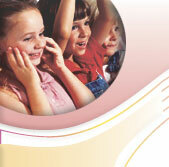 We offer after concert services to continue your child’s relationship with classical music beyond the concert hall. We can help find your child a teacher, a rental instrument, an academy, or just a place to play! It is our mission to make classical music a regular part of every child’s life! The Imagination Symphony offers affordable concerts per year. Join us for your first adventure in classical music, October 15th at The Athenaeum Theatre, funded by Chicago’s own NIB Foundation. See you at the show! sounds they will hear before attending an Imagination Symphony Concert.